The Roxy Banana Smoothie has a unique shape to lib tech that many prefer to the old C2 BTX. It’s called EC2 BTX and it lives somewhere between C2 BTX and BTX. E stands for elliptical camber so instead of a V like bend down there is more of a C like bend down after the rocker. This is more like the Never Summer Rocker/Camber but there is a more pronounced rocker between the feet. 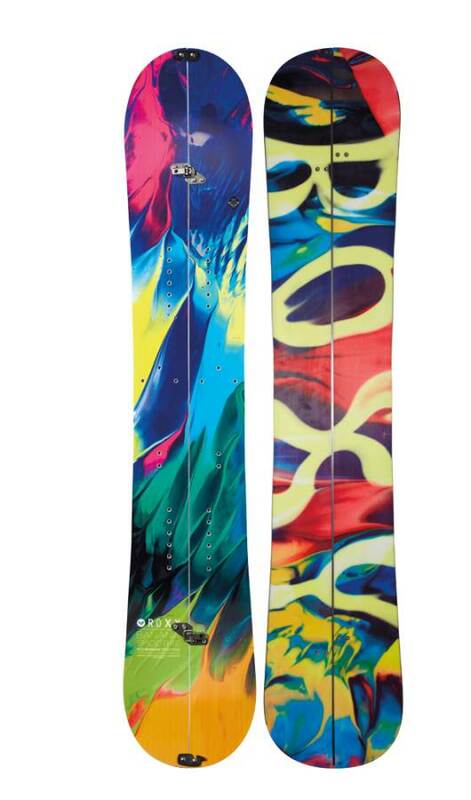 This provides a more loose ride but still allows your tail to grip the snow when in a moderate carve. This isn’t for everyone. If you live on the All Mountain side of All Mountain Freestyle you might want something else. If you want a freestyle ride with a little more to it then this might work. 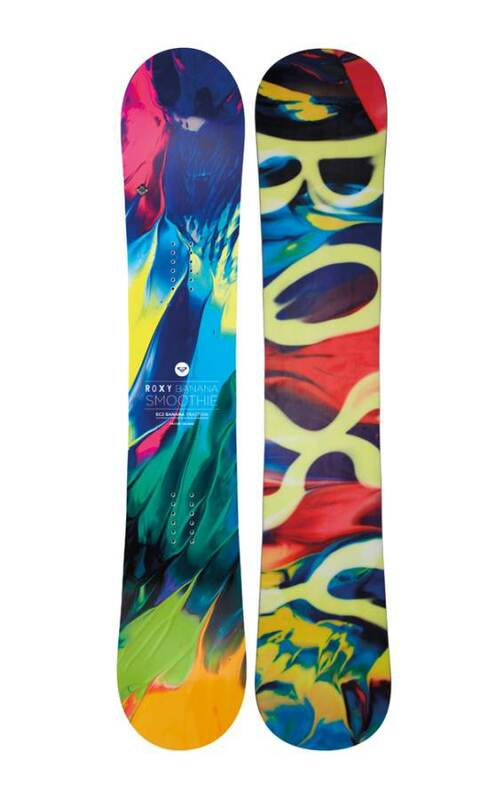 The Roxy Banana Smoothie is an interesting addition to the Lib Tech Quiver. It sits right in between the Ollie Pop and the Skate Banana Narrow in terms of performance. Many who felt that some of the Mervin boards MTX cut was too grippy will like the very mellow magnetraction side cut of the Banana Smoothie. Here is the breakdown. On Snow Feel– It’s loose somewhat unstable feel between the feet not ideal to attack the mountain at higer speeds but it was fun to play around on them and the tip/tail had enough bend to grip into a carve and prevent you from washing out like the Skate Banana does. Its more of a loose playful park board. Powder: For those that like a freestyle approach to powder days will think this is almost as good as it gets. The more mellow magnetraction isn’t as grippy as some of the Mervin boards are when it’s thicker and wet. In many cases we complain that there isn’t a setback for directional riding on powder days. In this case we aren’t complaining because this is a freestyle to all mountain freestyle ride and it’s meant to be centered. Turn Initiation and carving– Just as easy to get from edge to edge as the Skate Banana but more fun to do so. Not a great carving board but the tip/tail hold if you lean into a harder turn. Speed: The Banana Smoothie has a fast base like all Lib Boards but has some chatter at moderate speeds over the varied conditions. It also feels really loose compared to other hybrid rocker boards in the Mervin Line. If you want speed there are many other Mervin (lib-tech, Gnu and Roxy) boards that can outperform the Banana Smoothie. Uneven Terrain: Not bad here and it’s very easy to deal with end of the day snow. Approximate Weight– Like all Mervin boards they are well built and very reliable but this happens at an increase in weight. It’s still nothing terrible. Edge Hold: The Banana Smoothie seems to have one of the more mellow MTX side cuts of any board out there. If you combine that with the softer flex it makes for one of the only boards from Mervin that might be closer to great instead of excellent. Flex: Closer to the softer side of medium. It seemed to have the same flex throughout the entire board. It would have been better to see it a bit softer at the tip and tail but then it might chatter clown shoe style so this complaint might create a new complaint. Rails/Jibbing: This has almost a medium flex so it’s not as ideal as the skate banana but it’s ok. Pipe: It’s not as much fun in the pipe when it’s icy but it still does better than most. It’s more the loose feeling between the feet that’s the problem instead of the edge hold. Jumps: The Banana Smoothie is pretty poppy and it was fun to generate your own air. There are more poppy boards but this is definitely in the top rung. Hitting small kickers was much more fun than the pipe. All in all the Banana Smoothie was not what we expected in terms of an all mountain freestyle ride. We have seen other EC2 variations that acted very stable so it’s not that but this design is very loose and playful. If you want something that is loose like the skate banana but has a little more bite on a carve then this might work. We try to get as many images of the Roxy Banana Smoothie, but forgive us if they're not all there.